Environmental Air Sponge Odor Eater to the Rescue! 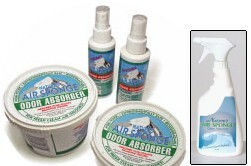 The instant odor absorbing air sponges and air sprays are human safe and environmentally friendly. They are the perfect replacement for all toxic deodorants, perfumes and other odor-masking products. Also, they are very efficient when used with any type of commercial atomizing system . The Environmental Air Sponge is a solid paste-gel made of polyethers, emulsifiesrs, acivated charcoal and hygroscopic and detoxifying agents. When the container is opened, the components work together to dissipate a stream of "lighter than air" molecules into the environment, interacting with and neutralizing odor and pollutant molecules. This creates a purer, fresher, healthier air quality. The 8 oz. odor elimination sponge works great in rooms from 200 to 300 square feet with an 8 foot standard ceiling. Depending on the air quality, the sponge can last four to six weeks. The 9 oz odor sponge is also available in a decorator container. The one pound tub is effective in a 400 to 600 square feet space with an 8 foot standard ceiling. Depending on the air quality, the sponge can last up to three months. NOTE: To achieve larger treatment areas, place the solid mass on top of the lid to maximize surface area exposure. One 4 pound container can cover spaces up to 2,400 square feet and can last up to four to six months, depending on the odor problem. It can also be placed on the return side of an air handling unit. This size is ideal for commercial applications, including smoke remediation, paint fumes, garbage control, industrial odors, chemical off-gassing, etc. NOTE: To achieve larger treatment areas, place the solid mass on top of the lid to maximize surface area exposure. The nstant Odor Absorber Air Sponge spray formula is not a masking agent, rather a formula that initiates a physical reaction to change the state of the odor molecule. A human safe and environmentally friendly product, it is the perfect replacement for all toxic deodorants and air fresheners. It is also very efficient when used with any type of commercial atomizing system. A few short mists of Instant Air Sponge spray will instantly neutralize even foul and obstructive odors on contact. Instant Air Sponge spray formula has a base of essential oils, plant and herb extracts. The Air Sponge cover is designed to fit over the 8oz. size Air Sponge for use in bathrooms, kitchens, mantels, etc. It may also be used with the 1lb. size, but it will not hid the entire container. Odor sponge metal wall mount is ideal for offices, restrooms, basements and public places. Mount your 1/2 lb and 1 lb Air Sponges out of sight. For Commercial Odor Control and Odor Removal Too! The Environmental Air Sponge has been successfully utilized as an antidote for offensive odors and fume pollution in a variety of large scale commercial applications. Among others, it has been used in sewer gas treatment facilities, municipal bus and subway systems, commercial airlines, hotels, hospitals and the restoration of buildings damaged by fire and other disasters. Use the Environmental Air Sponge to help prevent Sick Building Syndrome! We offer several other products that are very effective at odor removal. If the odors are in your refrigerator, the Refrigerator Ozonator is the best option. The Environmental Air Sponges are great for small spaces or one-time odor problems. They are a consumable product, so for on-going problems or larger spaces, consider the air purifiers listed on our Odor Control Overview page. Use the remaining "hardened" product in your vacuum cleaner bags. "I am writing you this letter to tell you how well Environmental Air Sponge worked for us. We recently had a fire in our restaurant. Phil's in Hanson, Massachusetts. The fire caused considerable smoke throughout both floors of the restaurant. The smoke odor was horrendous . . . placed a few containers of Air Sponge in the dining area where we were working and a couple in the basement at the source of the fire. Within a couple of days the air quality improved a great deal and within a week the smoke odor was practically gone. Air Sponge worked fantastically. We plan to use Air Sponge in the smoking section to control stale cigarette smell as well as the lingering cooking odors that hang around after the food is long gone. You have a great product that rids the environment of unwanted odors better than anything I have seen or heard of." "I have been using Air Sponge personally for a number of months. My children are asthmatic and I myself have allergies of the respiratory system. We therefore cannot use any of the products found on the market as they contain ingredients with strong odors that cause irritation of the respiratory tract and only cover up existing odors with fragrance. Since we started to use Air Sponge, the air in our home is odor free and at the same time it is not polluted. You cannot imagine what an ordeal painting becomes when your children are afflicted with asthma. We were very impressed when we used Air Sponge in the room being painted as neither my children nor I had to leave home that night. I tried Air sponge in a summer camp for asthmatic children and it was just wonderful. Air Sponge also proved a great help during my allergy attacks. These are only a few examples which lead me to highly recommend Air Sponge to all asthmatics as well as to those afflicted with respiratory allergies." "About three years ago, we turned the refrigerator off in our motor home to store it for the winter. Unfortunately, we forgot there was fish in the freezer and didnt find out until several months later what a lasting effect they have. For the past few years we have tried everything to get the smell out, including baking soda, bleach, and anything on the market that promised to absorb the odor. Needless to say, nothing worked until a friend recommended we try the Air Sponge. We couldnt believe it, but within a week of placing the air sponge in the freezer, the fish smell had vanished! The freezer continues to be fresh smelling, without a trace of the odor, even when its been turned off for several months. My husband and I have lived full time in our motor home for over a year. In the past we have had trouble with musty smells within our small space. Also keeping the refrigerator smelling fresh has been a big problem. Since we purchased the environmental Air Sponge we have not had that problem. I keep one in the refrigerator, under the kitchen sink and in the bathroom. It eliminates all those unwanted odors and everything smells fresh. They are long lasting and easy to use, just open it up and smells disappear. I'd recommend the Air Sponge to anyone wanting to keep their house smelling clean and fresh. "I own and operate a shoe and boot repair shop and use lots of different glue, solvents and other smelly stuff. I recently bought the Environmental Air Sponge to see if that would work in getting rid of these smells. I have used other air cleaners and odor reducers and they did not work so I was expecting this to be the same. I was very shocked when this product not only got rid of litter box odor but also glue, solvents, rubber and leather odor also. I love this product!!! I have recommended it to my family, friends and customers who ask why my shop doesnt smell like a shoe repair shop anymore. Thank you for a product that really works like the label says!" "We us Nature's Air Sponge at our Vet Clinic and sell it as well. We highly recommend this non-toxic, natural odor eliminator."